Estimates range from about 10 million to 30 million, according to policymakers, activists, journalists and scholars. The International Labour Organization, an agency of the United Nations that focuses on, among other things, labor rights, put the number at a “minimum estimate” of 12.3 million in a 2005 report. 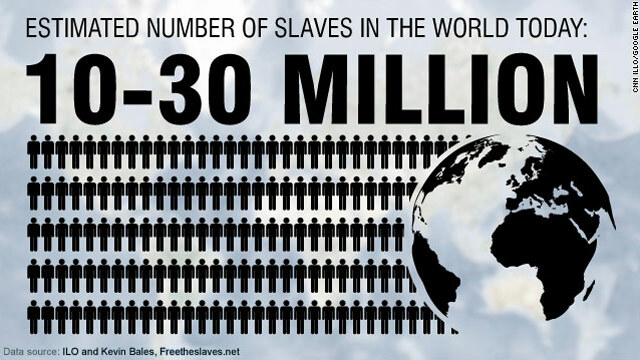 Kevin Bales, a sociologist who serves as a consultant to the United Nations and has authored several books about modern-day slavery, estimated the number was 27 million people in his book “Disposable People: New Slavery in the Global Economy.” The book was published in 1999. There is yet another estimate. Siddharth Kara, a fellow on trafficking at Harvard University and also an author, recently told CNN that his calculations put the range between 24 million and 32 million. That number was current as of the end of 2006, he said. “There are two big problems with the count,” Skinner, a Senior Fellow at the Schuster Institute for Investigative Journalism at Brandeis University, said during a telephone interview. “The first is that the people we are counting are, by definition, a hidden population.